It's hot in Washington. No sign of rain. The world's climates are changing, catastrophe beckons, but no one in power is noticing. Yet. Tom Wolfe meets Michael Crichton in this highly topical and witty and entertaining science thriller. When the Arctic ice pack was first measured in the 1950s, it averaged thirty feet thick in midwinter. By the end of the century it was down to fifteen. One August the ice broke. The next year the break-up started in July. The third year, it began in May. That was last year. It's an increasingly steamy summer in America's capital as environmental policy advisor Charlie Quibler cares for his young son, and deals with the frustrating politics of global warming. According to the President and his science advisor Dr S, the weather isn't important! But Charlie must find a way to get a sceptical administration to act before it's too late - and his progeny find themselves living in Swamp World. Just arrived in Washington to lobby the Senate for aid is an embassy from Khembalung, a sinking island nation in the Bay of Bengal. Charlie's wife Anna, director of bioinformatics at the National Science Foundation and well known for her hyperrational intensity, is entranced by the Khembalis. By contrast, her colleague, Frank Vanderwal, is equally cynical about the Buddhists and the NSF. The profound effect the Khembali ambassador has on both Charlie and Frank could never have been predicted - unlike the abrupt, catastrophic climate change which is about to transform everything. 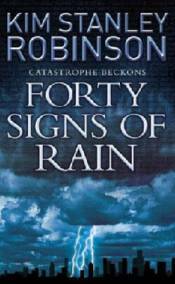 Forty Signs of Rain is an unforgettable tale of survival which captures a world where even the innocent pattern of rainfall resounds with the destiny of the biosphere.